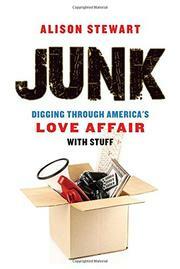 After spending months painstakingly sifting through knickknack boxes in her parents’ basement after the sale of the family home, journalist and TV host Stewart (First Class: The Legacy of Dunbar, America’s First Black Public High School, 2013) contemplated the nature of obsession, nostalgia, and our compulsive reliance on personal “stuff.” Her entertaining three-year exploration spans U.S. Route 411 from central Alabama to Tennessee, a stretch of Southern highway that becomes a 250-mile-long yard sale teeming with hives of eccentrics and their roadside tchotchke stands during a four-day autumnal “junk-a-palooza.” There, and throughout the many homes and storage units she examined, Stewart understood that “the key element of true junk is worthlessness.” However, behind the dusty boxes and overstuffed bins are real people; some harbor serious psychological impairments, while others seem trapped in a collection cycle, surrounding and guarding themselves with a disposable, ever expanding bloom of ephemera. “Letting go is a common problem for people who have attachments to things they know they no longer need but secretly still like or even love,” the author writes as more complicated issues of compulsive hoarding, loneliness, and disposophobia surface in other sections of her accessible, enthusiastic study. She conducts amusing interviews with experts in the big business of eviction clean-outs, junk removal, and recycling, and she queries the troubled creator of a three-story interconnected colossus of objects and the executive producer of TV’s Pawn Stars. Particularly engrossing chapters spotlight groups dedicated to the science intersecting identity and possessions and a NASA expert on intergalactic space junk. In all fairness, Stewart concedes that “what qualifies as junk is subjective,” and throughout her lively observations, she consistently remains respectful to those on all levels of the stockpiling spectrum. Absorbing and enjoyably compelling research on the packrat conundrum in our society.